Since an important degree of the carbon dioxide (CO2) that mankind emits in the atmosphere ends up in the ocean as a result of gas exchange through the air-sea interface, the ocean acidifies itself (because of the reaction CO2 produces when it contacts water). Ocean acidification is one of the perturbing anthropogenic effects (because of human activity), not only for maritime ecosystems but also for Man himself as he will have to adapt. He will have to deal with variations in fisheries and other costal touristic activities (reduction of corals, and so on). However, the anthropogenic CO2 penetration in the ocean is not uniform, and the cold Polar Regions will be affected by the change faster than the warm tropical regions. 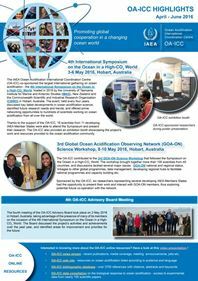 The study that we are conducting addresses several points of the quantification, in time and space, of anthropogenic CO2 penetration in the ocean. One of them has permitted the identification of breaking points. 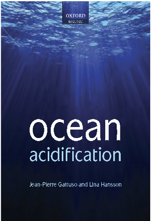 We demonstrate that four tipping points can be located in order to quantify risks of ocean acidification, which may have as a result the dissolution of calcium carbonates that are indispensable to marine ecosystems (shells, corals, and so on). Goyet C., Benallal M. A., Bijoux A., Guglielmi V., Moussa H., Ribou A.-C. & Touratier F., 2019. Evolution of the human impact on oceans: tipping points of socio-ecological coviability. In: Barrière O. (Eds. ), Coviability of Social and Ecological Systems: Reconnecting Mankind to the Biosphere in an Era of Global Change, pp 221-237. Springer, Cham. Chapter (subscription required).